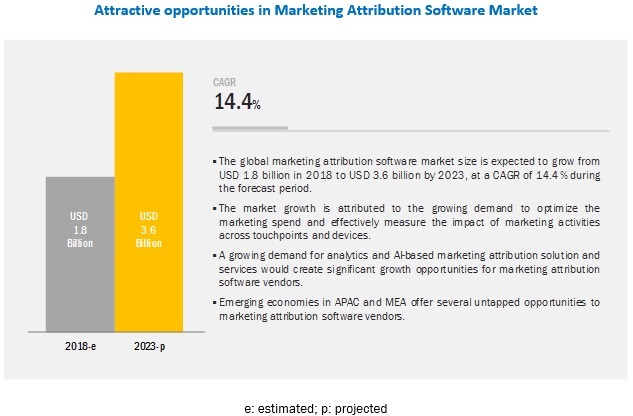 [153 Pages Report] MarketsandMarkets expects the global marketing attribution software market size to grow from USD 1.8 billion in 2018 to USD 3.6 billion by 2023, at a Compound Annual Growth Rate (CAGR) of 14.4% during the forecast period. The major growth drivers for the market include rising need to optimize the marketing spend and effective tracking of customer behavior for targeted marketing activities. Multi-source attribution assigns credit to each channel involved in the final lead conversion. It tracks the entire customer journey and attributes credit to multiple touchpoints, which include all sources, such as ads, social posts to webinars, and eNewsletters. This attribution type does not measure the actual contribution of different channels and is complex to implement. Multi-source attribution has 6 different models, namely, linear, time decay, U-shaped, W-shaped, full path, and custom models. The cloud-based deployment model permits users to access the software from anywhere or any device, such as personal computers, laptops, and mobiles. The cloud deployment model offers easy deployment options, minimum costs, easy upgradeability and accessibility, and no initial capital outlay for purchasing the software. Furthermore, it reduces Information Technology (IT) budgets, lowers financial risks, and increases flexibility. Organizations demand solutions to efficiently manage and repurpose their web-based content, along with integrating it with other systems, such as customer relationship management and marketing resource management. This, in turn, empowers organizations to strengthen their marketing endeavors cost-effectively. SMEs consider and prefer cloud-based marketing attribution solutions, as they help them reduce operational cost and increase productivity. Enterprises in the telecom and IT vertical are focusing on effectively targeting new users and decreasing attribution rate of the existing customers. Moreover, they are emphasizing on implementing effective marketing campaigns to increase its subscriber base, thus are targeting users via different online channels. Following the fierce competition in the market, enterprises need result-oriented marketing strategy in place for acquiring maximum users and have a competitive edge over its competitors. The increase in the number of internet and mobile devices is said to have fueled the growth of the telecom and IT vertical in the marketing attribution software market. Marketing attribution solutions help telecom and IT enterprises to analyze effective digital channel to optimize its marketing spends and improve user experience. This vertical is at the forefront of leveraging marketing attribution solutions, due to the emerging need for effectively targeting an audience via a right communication channel. The global telco providers are embracing marketing attribution strategies to facilitate their marketing campaigns and improve end-user experience. 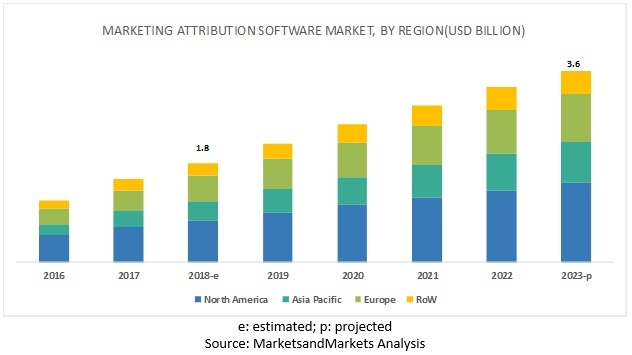 North America is expected to hold the largest market size and dominate the global marketing attribution software market from 2018 to 2023. The region majorly has a high concentration of large multinational companies, which largely contribute to the growth of the market. APAC is expected to provide lucrative opportunities for the marketing attribution software vendors, owing to the increasing demand for the consistent data-driven marketing solutions among enterprises in the region. The increasing number of government regulations and compliances in various regions could affect the adoption of marketing attribution software. Major vendors offering marketing attribution solution and services across the globe include Adobe (US), Google (US), SAP (Germany), Visual IQ (US), Oracle (US), Rockerbox (US), Neustar (US), Engagio (US), LeadsRx (US), LeanData (US), Singular (US), Marketing Attribution (US), Attribution (US), CaliberMind (US), WIZALY (France), OptiMine (US), Analytic Partners (US), Merkle (US), Fospha (UK), and IRI (US). Adobe has established itself as a strong brand among the leading players in the market attribution software market. The company is strengthening its product portfolio by introducing new products and updating the existing products with new capabilities. It focuses on delivering services to content creators, digital media professionals, and web application developers. The company constantly invests in R&D activities to strengthen its solutions. For instance, in 2017, the company has invested 16.8% on revenue on R&D activities. It has adopted inorganic growth strategies, such as acquisitions and partnerships, to strengthen its offerings and presence in the market attribution software market. For instance, in October 2018, the company acquired Marketo to offer a combination of Adobe Experience Cloud’s analytics, personalization, and content capabilities with Marketo’s lead management, account-based marketing, and revenue attribution technology to its customers. In October 2018, Adobe acquired Marketo, one of the leading B2B marketing engagement platform providers. This acquisition enabled Adobe to offer a combination of Adobe Experience Cloud’s analytics, personalization, and content capabilities with Marketo’s lead management, account-based marketing, and revenue attribution technology to its customers. In October 2018, Oracle launched a new Small and Medium-sized Business (SMB) data cloud solution for B2B marketers. The new solution is aimed at helping B2B marketers reach out to 115 million IDs in more than 1.5 million SMBs with digital marketing campaigns. It would enable sales teams to perform account-based marketing for reaching contacts at SMBs scattered across 48 industry and sub industry segments. In May 2018, SAP launched SAP Customer Data Cloud Solutions from Gigya. These are the only solutions available in the market that are based on the consent-based data model. They enable the delivery of personalized marketing campaigns. Additionally, they would help organizations in retaining their customers and boosting their brands’ loyalty by providing them with transparent, flexible, and secure digital experience. In September 2017, Nielsen Holdings, one of the global performance management company, acquired Visual IQ. The acquisition would help Nielsen improve its ability to collect and process a large pool of datasets by leveraging Visual IQ’s MTA software. Furthermore, it would enable Nielsen to expand its clientele in the arena of advertisers, retailers, and publishers. What are the major challenges faced while deploying marketing attribution solutions in different application area? Where and to what extent organizations need marketing attribution solutions? What are key industry trends in marketing attribution software market? What is the level of preparedness of enterprises to deal with unforeseen business risks? What are the challenges faced by marketing attribution solutions providers while integrating innovative technologies with a client’s existing IT infrastructure? *Details on Business Overview, Products, Solutions & Platform, Key Insights, Recent Developments, SWOT Analysis, MnM View might not be captured in case of unlisted companies. The study involved 4 major activities to estimate the current market size for marketing attribution software market. Exhaustive secondary research was done to collect information on the market. The next step was to validate these findings, assumptions, and sizing with industry experts across the value chain using primary research. Both top-down and bottom-up approaches were employed to estimate the complete market size. Thereafter, the market breakup and data triangulation procedures were used to estimate the market size of the segments and sub segments of the market. In the secondary research process, various secondary sources, such as D&B Hoovers, Bloomberg BusinessWeek, and Factiva, have been referred to, for identifying and collecting information for this study. Secondary sources included annual reports, press releases, and investor presentations of companies; whitepapers, certified publications, and articles by recognized authors; gold standard and silver standard websites; regulatory bodies; trade directories; and databases. The marketing attribution software market comprises several stakeholders, such as marketing attribution software vendors, digital marketing solution providers, managed service providers, marketing analytics vendors, advertising agencies, system integrators, consulting service providers, resellers and distributors, research organizations, government agencies, enterprise users, technology providers, venture capitalists, private equity firms, and startup companies. The demand side of the market consists of enterprises across industry verticals comprising Banking, Financial Services and Insurance (BFSI); media and entertainment; consumer goods and retail; healthcare and life sciences; manufacturing; telecom and Information Technology (IT); transportation and logistics; travel and hospitality; and energy and utilities. The supply side includes marketing attribution software providers offering marketing attribution solution and services. Various primary sources from both the supply and demand sides of the market were interviewed to obtain qualitative and quantitative information. After arriving at the overall market size using the market size estimation processes as explained above, the market was split into several segments and sub segments. To complete the overall market engineering process and arrive at the exact statistics of each market segment and sub segment, the data triangulation and market breakdown procedures were employed, wherever applicable. The data was triangulated by studying several factors and trends from both the demand and supply sides. Adobe (US), Google (US), SAP (Germany), Visual IQ (US), Oracle (US), Rockerbox (US), Neustar (US), Engagio (US), LeadsRx (US), LeanData (US), , Singular (US), Marketing Attribution (US), Attribution (US), CaliberMind (US), WIZALY (France), OptiMine (US), Analytic Partners (US), Merkle (US), Fospha (UK), and IRI (US).